350 gms Water (or 350mls) weighing is more accurate!! Place a roasting tin in the bottom of the oven to heat up. 3. If using the fresh yeast add to the bowl on the opposite side to the salt and rub in with a little flour. If using dried yeast, just add. 4. Mix all together and add the water. 5. Mix around using a dough scraper until all the liquid is incorporated. 7. Knead thoroughly for 10 minutes, stretching and pulling. The better you do this, the stronger the structure of the loaf and therefore a better finished result, especially if you are creating a loaf without the use of a tin. 8. Place into a clean lightly oiled bowl , cover and leave to prove at room temperature until doubled in size, about 1 hour - 1½ hours. 9. Tip the dough out on to a lightly floured surface and gently reshape. 10. 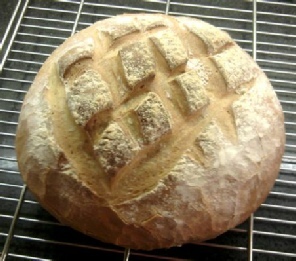 Use to create the shapes that you want, rolls, bloomer, cob, tin...the choice is yours! 11. Cover and leave to prove for about an hour until well risen. TIP Don't put your bread into a warm place e.g. an airing cupboard, it will rise just as well in a normal temperature room, you also get a better flavour the longer the 'prove'. Bread will even rise in a fridge, it just takes longer! !